“My name is Jenna Rice and I live in a small town in Vermont. 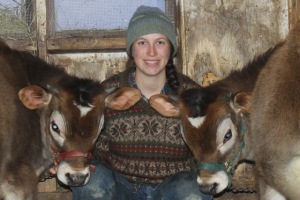 I am a homeschool student in my junior year focusing on learning about farming and sustainable agriculture. I am doing things like growing a garden, training a team of oxen, and working on a small farm. I made the video below for a contest called Restore My Climate. On the Restore My Climate webpage, the competition is introduced in this way: “Climate change is the issue of our time, but America’s public dialogue on the issue is characterized by pessimism and misunderstanding. This creates a confusing picture of what’s happening and what we can do now about climate change. Jenna’s video went on to win third place in this national competition! She produced the video using her own photographs, script and music. For more on Jenna and her self-directed learning and action, visit her blog, Bright and Bold. This entry was posted on Monday, June 30th, 2014 at 6:19 am	and is filed under Farm Blog, SLN Blog, Youth Blog. You can follow any responses to this entry through the RSS 2.0 feed. You can leave a response, or trackback from your own site. Excellent to see the next generation doing such great work! Here’s to youth carrying on! Wow, Jena – great piece and great expression! “If together we are powerful enough to change the climate of an entire planet then… we have the power to put it right.” Beautifully said and the call from your heart is definitely heard. Inspiring, Jenna! Your combined narration and images makes action on climate change so obvious and appealing! Great going Jenna! Your message is clear and inspiring, thanks for doing this.